FRESNO, Calif. – Four of the fighters who will appear on a top-notch STRIKEFORCE Challengers event presented by Rockstar Energy Drink at Save Mart Center in Fresno, Calif., live on SHOWTIME® at 11 p.m. ET/PT (delayed on the West Coast), this Friday, Oct. 22, participated in an Open Media Workout on Wednesday at Fort Washington Fitness. The four were heavyweight Lavar “Big” Johnson (14-3), of Madera, Calif., who faces Virgil “RezDog” Zwicker (8-1) of Temecula, Calif.; undefeated Fresno resident Billy Evangelista (10-0, 1 NC), who takes on Waachiim “Native Warrior’’ Spiritwolf (8-6-1) of San Diego in a 165-pound catch weight bout, world-ranked Shana “Rock Solid’’ Olsen (4-0), of Diluth, Minn., who faces highly regarded Canadian Muay Thai Champion Julia “The Jewel” Budd (pro debut), of Sechelt, British Columbia, at 145 pounds, and Fresno heavyweight Brandon Cash (4-2), who battles John Devine (5-2) of San Francisco. In this Friday’s main event, welterweight Relentless” Roger Bowling (8-0) will put his unbeaten record on the line one more time against “Vicious” Bobby Voelker (22-8) of Kansas City, Kan., in a rematch of an exciting fight last May 21 that ended prematurely due to an accidental poke in the eye. Tickets for the STRIKEFORCE Challengers event are on sale at the Save Mart Center box office, select Save Mart Supermarkets, all Ticketmaster locations (800) 745-3000, Ticketmaster online (www.ticketmaster.com) and STRIKEFORCE’s official website (www.strikeforce.com). Doors will open at 4:45 p.m. PT. The first preliminary bout will begin at 5:30 p.m. The first televised match starts at 8 p.m. PT. “I feel good and I am very happy to be on a STRIKEFORCE card that has so many of my (Fresno Pro Buhawe) teammates on it. I’m excited for everybody. “I know Zwicker will be ready. He’s a fast, scrappy fighter who comes to fight. He may be a little shorter than me, which will definitely be a little different. The last two guys I’ve fought have been taller. “I’ve been working really hard. I want to keep this winning streak going. I’ve prepared like I always do. I don’t watch tapes. My job is to do the best I can and not worry about my opponent. 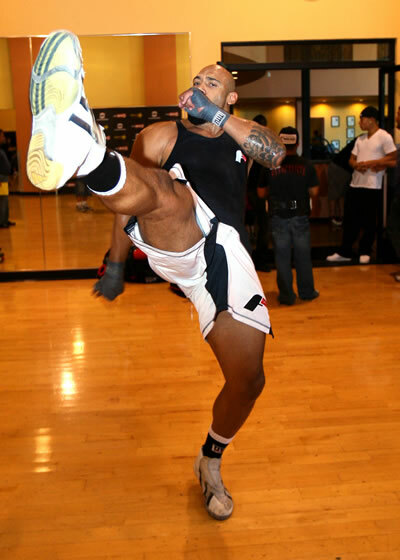 “I’m really excited about fighting for STRIKEFORCE the first time and fighting on SHOWTIME. I consider myself a well-rounded fighter and look forward to displaying my skills. “It’s always great when STRIKEFORCE comes to Fresno because they use a lot of local fighters like me. I don’t like losing and I lost the last time I fought in Fresno so I appreciate STRIKEFORCE giving me another chance.